Beto O'Rourke, the Democratic nominee for U.S. Senate, said Wednesday that he raised a stunning $10.4 million in the second quarter of 2018, more than double what the Republican incumbent, Ted Cruz, will report taking in over the same period. *Editor's note: This story has been updated to reflect Ted Cruz's second-quarter fundraising numbers. Beto O'Rourke, the Democratic nominee for U.S. Senate in Texas, raised more than $10.4 million over the past three months, he announced Wednesday, revealing a sum that takes his already massive fundraising to new heights. And the El Paso congressman again vastly outraised the Republican incumbent, Ted Cruz, who took in less than half of his challenger's haul — $4.6 million — in the same time, according to his campaign. 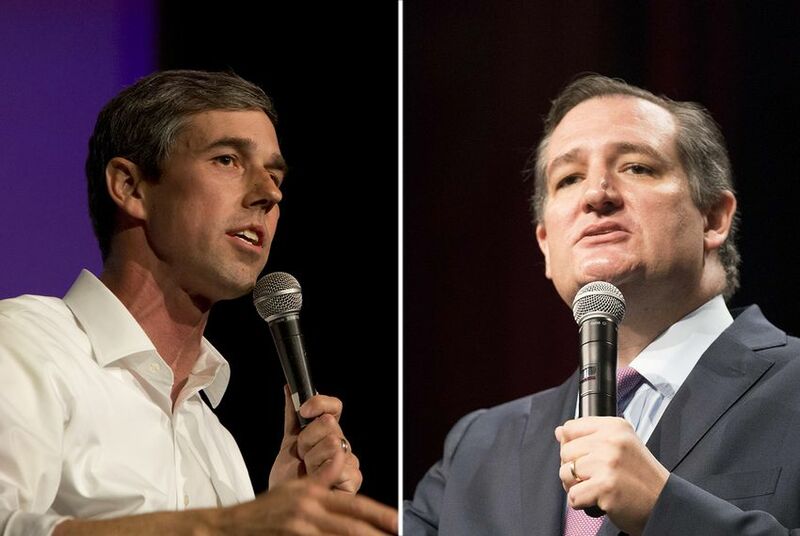 O'Rourke also took a decisive lead in cash on hand over Cruz with four months to Election Day, $14 million to $10.4 million. O'Rourke's latest haul is easily his biggest yet — topping the $6.7 million he raked in during the first quarter, which was far more than Cruz raised for the same period. Cruz's second-quarter fundraising also was his largest yet, though not nearly enough to keep up with O'Rourke's torrid pace. O'Rourke has now outraised Cruz for every period but one since O'Rourke launched his Senate bid in March 2017. O'Rourke announced his latest fundraising numbers Wednesday night on Facebook Live, while Cruz's campaign shared his several hours later. Cruz's campaign takes into account three groups when announcing his figures: his re-election campaign, a joint fundraising committee and a leadership PAC. Both candidates face a Sunday deadline to report their full second-quarter finances to the Federal Election Commission. Briefing his supporters Wednesday night, O'Rourke highlighted in particular the big increase his campaign saw in the number of individual contributions to his campaign — from roughly 141,000 in the first quarter to 215,714 in the latest period. O'Rourke's campaign said that about 70 percent of his donations are continuing to come from Texas, and the candidate said on the Facebook broadcast that the average contribution was $33. "You have made something absolutely extraordinary happen in Texas," said O'Rourke, who is not accepting PAC money. "Extraordinary because we can’t find many other Senate races that have raised this kind of money in a three-month period. We can’t find one in Texas — maybe ever — that has done this, and to do it in this way, through small-dollar contributions — that's what democracy looks like." Cruz's campaign said it was "deeply grateful" to its donors — and took a swing at O'Rourke, who Cruz has been hammering for months as too liberal for Texas. "The last month has made the decision for voters more clear," Cruz spokeswoman Emily Miller said in a statement, pointing to O'Rourke's comments that he is "open" to abolishing the Immigration and Customs Enforcement agency and that he would vote to impeach President Donald Trump. "In contrast, Sen. Cruz has spent the last six years successfully fighting for the issues that matter to Texans: promoting jobs, cutting taxes, reducing regulations, securing the border, expanding school choice and defending the Constitution." A Texas Tribune analysis published in May found that over the course of 2017 and the first quarter of 2018, O'Rourke raised $13.2 million through his campaign account compared to $11 million raised by Cruz via his campaign account and two affiliated political action committees. O'Rourke's numbers have been robust enough to count him among the the top fundraisers in the country this cycle among candidates for the Senate, according to data collected by the Center for Responsive Politics. Claire Parker contributed to this report. Texas has 254 counties. Beto O’Rourke has campaigned against Ted Cruz in each of them.